Fall is known for starting new routines, projects, and schedules. 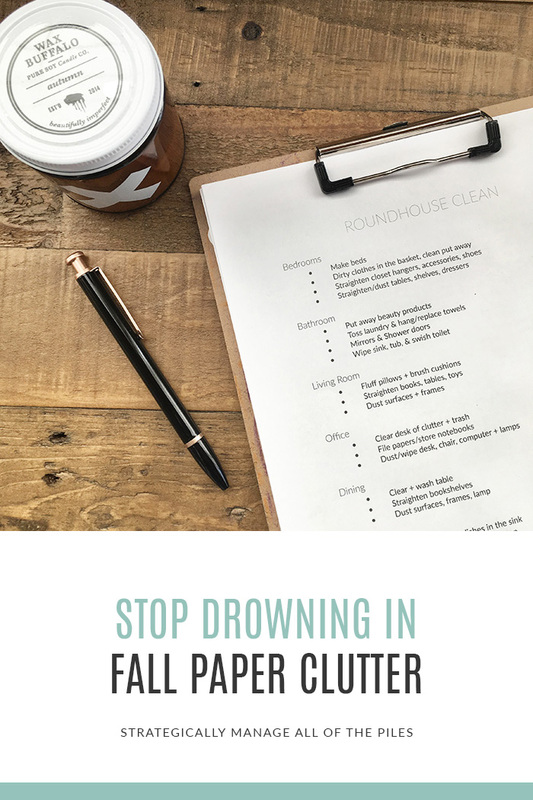 There’s lunches to pack, appointments to figure out, school supplies to buy, and a constant stream of the dreaded fall paper clutter. My two oldest are in school full time and the third is in preschool two days a week this year. The forms, calendars, homework, open houses, fundraisers, coupons, bake sales, book clubs, supplies lists, folders, art projects, science fairs, waivers, etc. are just way too many details for my little creative brain to keep up with. I’m sure many of you even have it worse with more kids in school or homeschooling. I’ve battled paper clutter before, but it seems especially out of control during this season. The incoming paper does not end. So I needed some serious strategies to survive the fall season and all of its details. 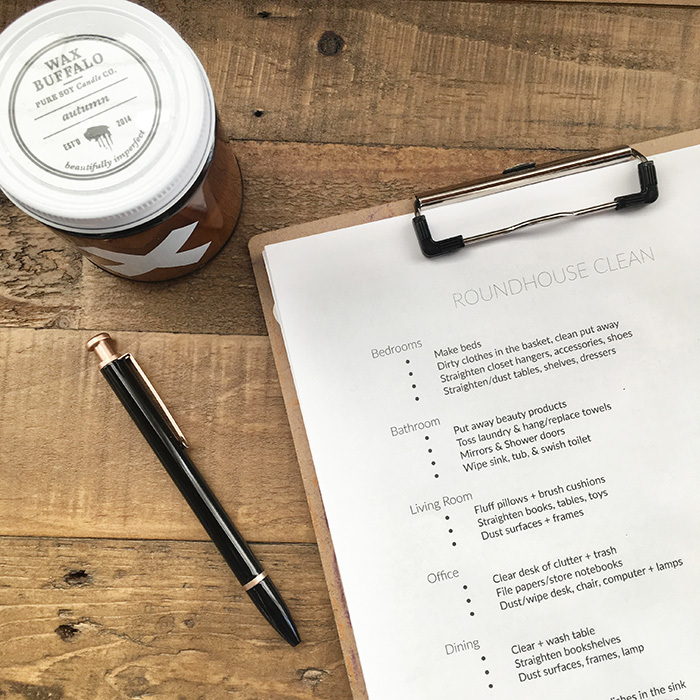 Here’s what I’ve come up with but feel free to share your tips too so that more of us can have cleared kitchen counters (for the love!). This is so that things that need done NOW are highly visible. If any forms come in that I have to take action with, I clip them to the board so they don’t get lost in the shuffle. Keep this clipboard in an easy-to-access place in plain view. Hang it up. The folder is for temporary papers. The bin is for keepsakes. Each person unloads their backpack of papers into the folder that pertains to them and clip important things to the clipboard. Over the weekend, I empty the folders into their special bins, saving only the keepsakes like artwork, awards, reports. 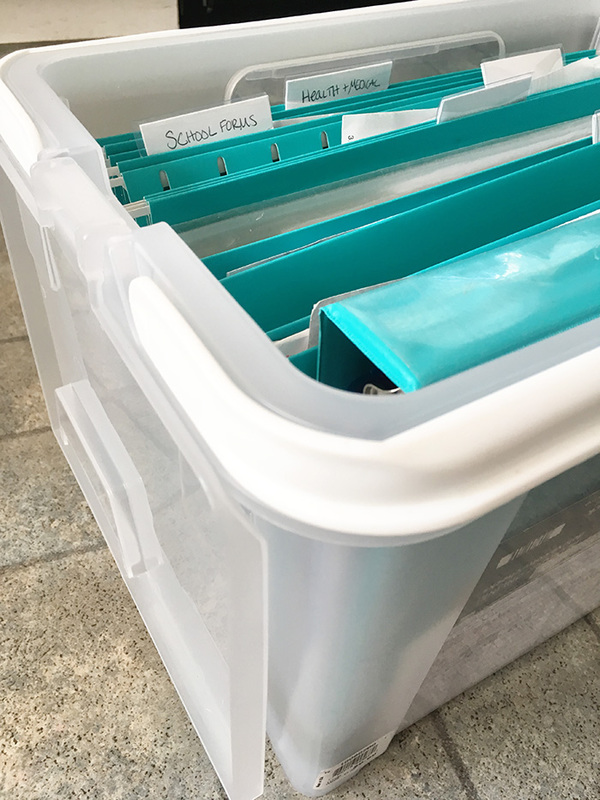 These hanging file bins from the Container Store are my favorite because they are slim enough to fit in a cabinet and easy to open. I also love their cute colored hanging folders and their erasable labels. I am constantly needing to be reminded of pretty much everything. Which school cycle day is it? What’s today’s menu? When is that lesson, appointment, picture day? I have to have it all in one place or it’s going to be forgotten. 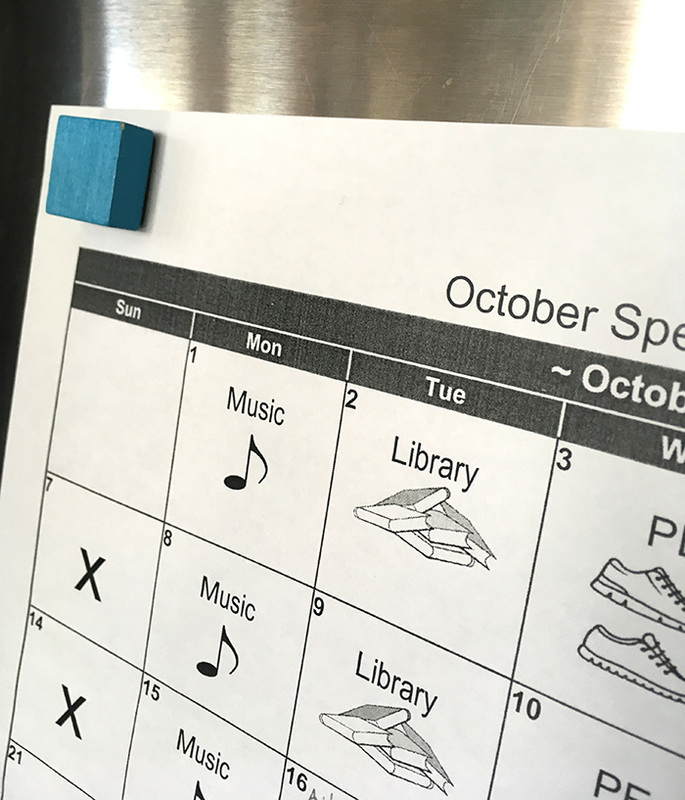 We keep the important calendar details on the refrigerator and then get rid of event papers. That way everyone can easily check it multiple times a day and don’t lose track of those details as easily. Sometimes you need to know details when you’re not at home. Or sometimes your 3-year-old throws away the calendar on the fridge. When you don’t want to keep track of a form, quickly enter the info on your phone. You can use Google Calendar, Asana, the Notes App, or just screenshot a form. That way, you don’t have to dig through papers to find details and it's always with you. Your turn! What are your tips for surviving the paper clutter?